It appears the Burnham has offered mazes for public entertainment on two different sites: the ‘Pleasure Gardens’ near to the station and the ‘Puzzle Gardens’ on the Berrow Road. There do remain some puzzles about these attractions. This description is clearly of the premises shown on the Berrow Road on the o.s. map of 1844-88 below. The precise year of the collection of this o.s. data for Burnham is not known but it can be seen that there is no maze shown in the grounds. However, on the same map is shown the ‘Pleasure Gardens’ situated just north of the station off what is now Technical St. It is not clear when these gardens were established. Curiously this maze is an almost exact replica of the one at Hampton Court, as mentioned in the guide. Given George Reed’s involvement in the railway and the Reed’s Arms Hotel, one would speculate that he might have an interest in an attraction for excursionists so close to the station. Despite its apparent status as an attraction it is odd that we have not seen any photographs or postcards of this pleasure garden (if anyone has any please contact us). 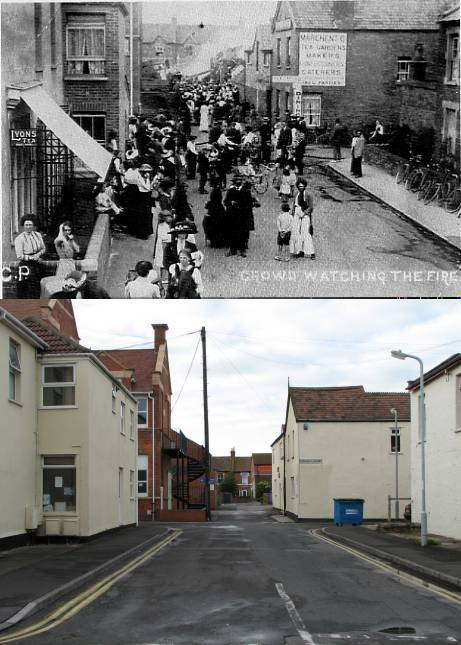 The closest we have is this ‘then & now’ below of a crowd watching a fire in buildings along what would have been the western side of the pleasure gardens. 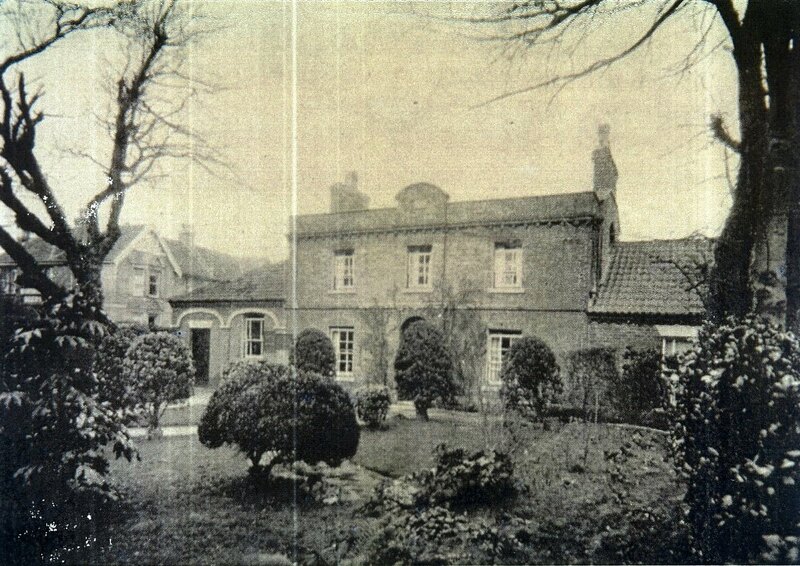 In this photo (date to be confirmed) we can see that Marchent’s Tea Room & Gardens still exists. However, it is likely that by this time the larger pleasure gardens and maze would have been built over, as Jubilee St, which crosses the site of the maze, was no doubt built in 1897 (Queen Victoria’s Diamond Jubilee). 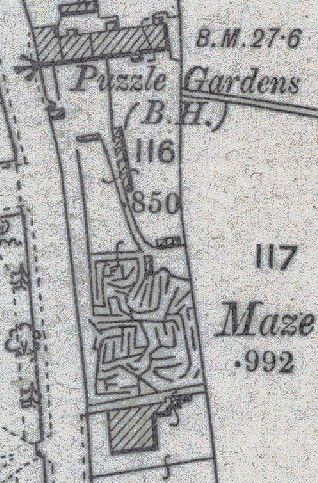 To add to the puzzle, the o.s map of 1894 – 1903 (below) now shows a maze at the ‘Puzzle Gardens’, however it is not a replica of the Hampton Court maze, but a rather more complex looking one. It can be seen that the site of the maze is the land now occupied by numbers 44 and 46 Berrow Road. Could this be a replacement for the original maze at the ‘Puzzle Gardens’? If so why, given that a maze takes some time and investment of effort to establish? 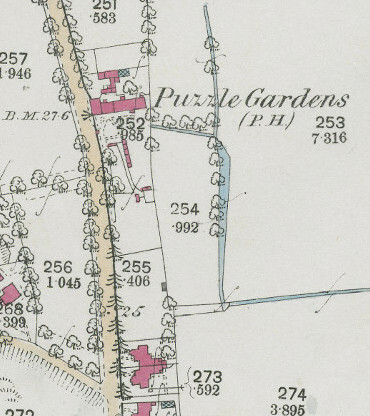 Why is no maze shown at the ‘Puzzle Gardens’ on the map of the same period as the one shown at the ‘Pleasure gardens’? And how is it that the ‘Pleasure Gardens’ maze was of similar design to that attributed to the ‘Puzzle Gardens’ in the 1859 guide? Is the guide mixing up the two mazes?